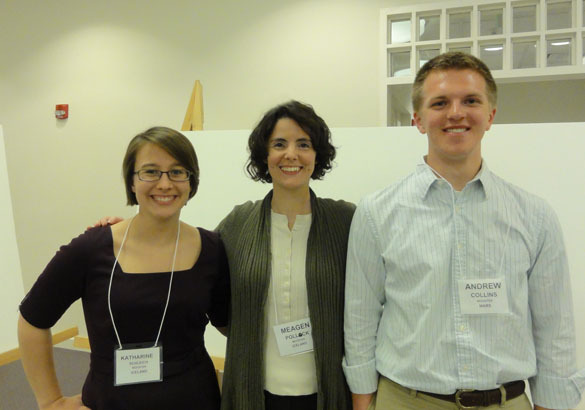 AMHERST, MA – Congratulations to Wooster Geology Seniors Katharine and Andrew for their excellent presentations at today’s Keck Symposium! 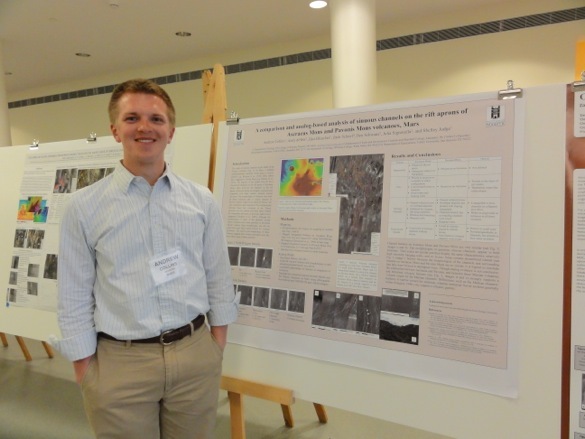 Andrew presented the results of his remote sensing investigation of channels on Ascraeus Mons on Mars. Andrew compared his channels to those on Pavonis Mons and in Hawaii. He characterized his channels as volcanic in origin based on their spatial distribution, surface stratigraphy, and geomorphological relationships. Andrew poses by his poster during a rare quiet moment at the poster session. 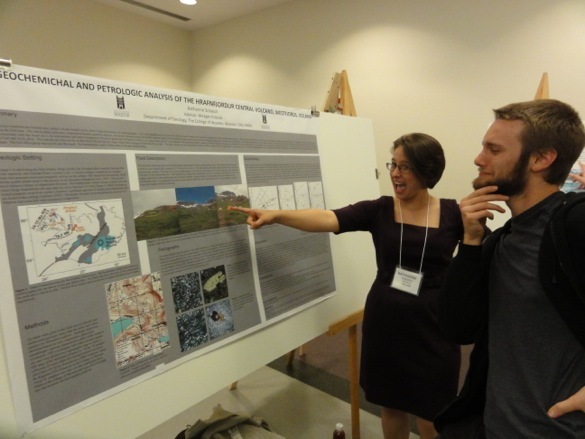 Katharine presented her study of the Hrafnfjordur central volcano in the West Fjords of northwest Iceland. She found a complicated sequence of eruptive units that includes pyroclastic material, basalt, andesite, and dacite. Using geochemistry, Katharine determined that the units fall on different, genetically unrelated trends, suggesting that the Hrafnfjordur central volcano has a complex magmatic history. Katharine enthusiastically explains her study to a thoughtful listener. Overall, the Keck students are truly a motivated and talented bunch. It’s amazing to see what these students have accomplished over the course of a year. The symposium is not only a celebration of their achievements, it’s a powerful moment in which these students officially become part of the Keck alumni family. The 2011-2012 Wooster Keck alumni.